This event is FREE. To receive two (2) free bags of compost per household, just show the event flyer (http://cmsdca.gov/images/slides/compost_donation_event_flyer_2019.pdf) and proof of residency in Costa Mesa or Newport Beach. Compost is available while supplies last. 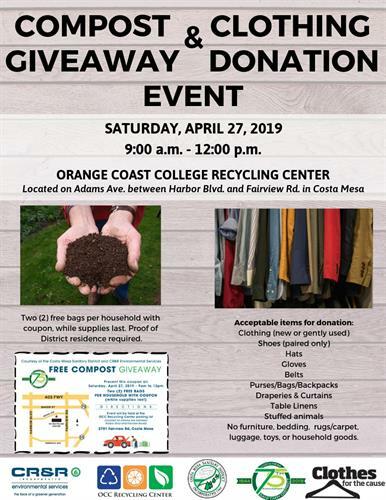 To celebrate Earth Day, the Costa Mesa Sanitary District (CMSD) will be hosting its first-ever free compost giveaway along with its second annual donation drive at the Orange Coast College Recycling Center on Saturday, April 27, from 9 a.m. to 12 p.m. This year, the District is partnering with Clothes for the Cause to collect gently used items, such as clothes, shoes, purses, curtains, and more. For a full list of accepted items, view the event flyer here: http://cmsdca.gov/images/slides/compost_donation_event_flyer_2019.pdf. Please do NOT bring furniture, bulky items, or hazardous materials. Clothes for the Cause will recycle, repurpose, and reuse the donated items. Many of the textiles are sent to Mexico and Costa Rica and resold, so they will be given a new life and kept out of the landfill! Additionally, all proceeds from the donated items will go to local schools that participate in the District’s annual Alkaline Battery Recycling Contest. The free compost giveaway is sponsored by CMSD’s trash hauler, CR&R. 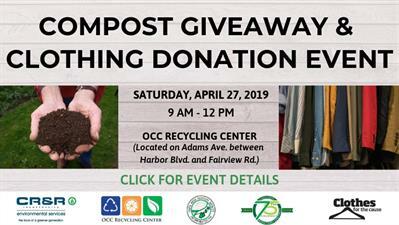 Please stop by the event and present the coupon on the event flyer (http://cmsdca.gov/images/slides/compost_donation_event_flyer_2019.pdf) to receive up to two (2) free bags of compost per household, while supplies last. Proof of residency will be required along with the coupon to receive the free compost.